Personal, proven formula for successful living that will turn your life into a masterpiece of health, wealth, and happiness. These principles have been used by thousands, with tremendous results. Apply them, and you’ll experience dramatic improvements in every area of your life. A once-in-a-lifetime opportunity! One of the most inspiring motivators of all time with a message that will change your life! Ed Foreman has lived an incredible life, and achieved things that few people dream of. 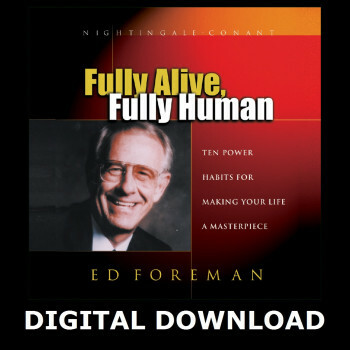 In Fully Alive, Fully Human, Ed Foreman introduces you to his personal, proven formula for successful living: 10 “Power Habits” that will turn your life into a masterpiece of health, wealth, and happiness. These principles have been used by Ed and thousands of his students, with tremendous results. Apply them, and you’ll experience dramatic improvements in every area of your life. Control your responses to life’s challenging situations, instead of letting them control you.